I Was Born to Be: A guide to fulfilling your lifelong dreams, getting out of your own way and how to get your ideas off the ground. I Was Born to Be: A guide to fulfilling your lifelong dreams, getting out of your own way and how to get your ideas off the ground. I Was Born to Be: A guide to fulfilling your lifelong dreams, getting out of your own way and how to get your ideas off the ground. In the new book "I was Born to Be," Jan Mendoza will teach you: *How to fight your inner negative voices that keep you from your dreams *How to manage your time as well as set and keep goals *How to get your ideas off the ground and sold *The mysteries of marketing your idea *Personality types and how to deal with all of them in order to get what YOU want *Successfully climb that corporate ladder and GET that promotion Family and your inner being *How to deal with teenagers and adult "children " *The legal facts on divorce/separation and how to survive both *How to stay happy by LIVING Jan Mendoza has written a book that will teach you how to over come all of the obstacles that have kept you from that project you've always dreamed about. 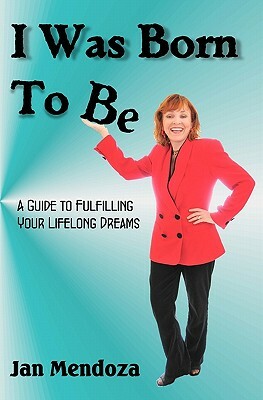 Title: I Was Born to Be: A guide to fulfilling your lifelong dreams, getting out of your own way and how to get your ideas off the ground.